Well this morning I got another lovely surprise! The gorgeous Brenda over at Mummy Time bestowed the lovely honour on me! So thank you, Brenda! I so enjoy reading your blog, that has me laughing out loud most days! You're a star. 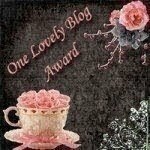 Pass the award to other blogs that you have newly discovered. Lanie at Edible Urban Garden who will one day inspire me to turn my dust bowl into a green wonderland. Tiny at Tiny Trappings whose artistic take on the world colours my life. Sarah at Forever in Acrylic Afternoons who inspires me and makes me laugh! Sharnia at Chronicles of Sharnia who has a darn good read. Thanks! You girls brighten up my day!